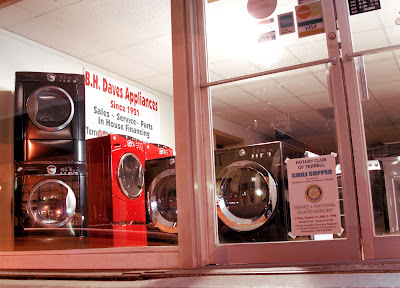 Tonight's shot is a window display of BH Daves Appliances in downtown Terrell. As the sign says, the store has been in operation since 1921! Pretty cool, in my opinion. I bought a set of LG stackable washer and dryer last year, and I have to say I LOVE THEM! the extra money for a front loader is well worth it, i think! i love the light inside the dryer so you can get that last sock! i sound like i should be selling appliances =) 23 days left til the election! Yes, they did my clothes right when I was down there last month!!! hehehe!!! BTW - the Edgewood Steeple photo would have been a good Sky Watch Friday post! For shame for shame!!! Nice shot, Brian. Having a washer and dryer of your very own is so wonderful. While we have to feed coins into the ones on the first floor, at least we can ride the elevator and don't have to go outdoors! I love the simplicity of that shot of the steeple. Will you post photos of the Shipley's accident? Were you and Grandma inside when the van hit? I always liked John Denver. It is good that we have his music.